During the past two Mondays, I had the opportunity to help out with Prairie Plains Resource Institute’s Summer Orientation About Rivers (SOAR) program. It’s the best summer day camp I’ve ever been involved with, and my kids, my wife, and I have all enjoyed being part of it over many years. This year, I was tasked with talking to kids (about 8 kids at a time) about the value of biological diversity in ecosystems. 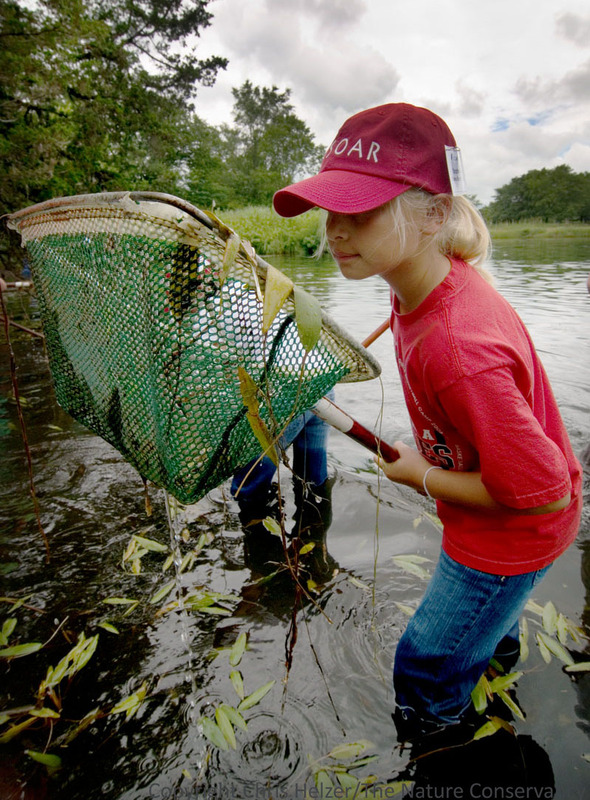 Dip netting for aquatic animals at SOAR back in 2010. I needed an activity that would keep the kids engaged for about 15 minutes and send them away with an appreciation of why prairies need to have so many species in order to function well. With the help of my wife, I came up with a pretty good plan. Then I refined it a little each time I presented it to a new group of kids. It turned out well enough that I decided I’d share it here as well – I hope it helps you think about the same concepts I was trying to pass on to the kids. I started off by talking about ordering food at a fast food restaurant. When you walk in, you go up to the counter and order food from the cashier. What happens if that cashier is sick that day? Do you just go home hungry? No, of course not – the restaurant has more than one person who can do that job, so someone else fills in and you still get to eat. Well, the same kind of thing happens in nature. 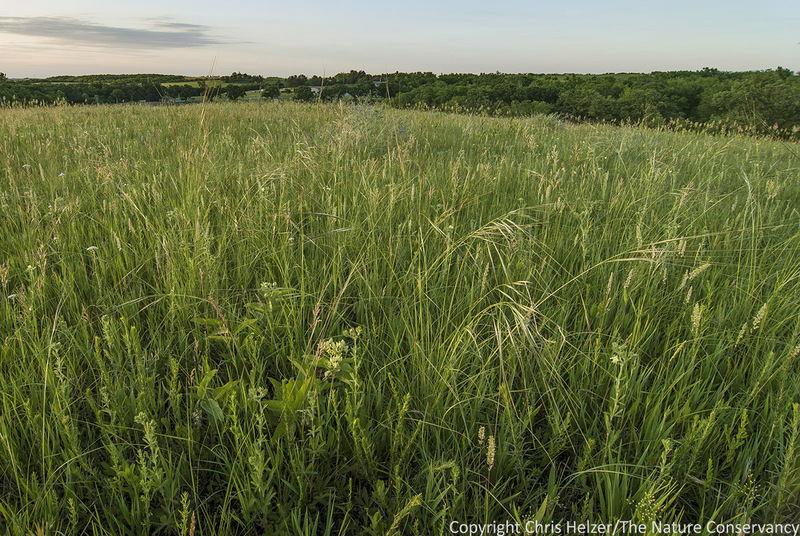 Each organism in a prairie plays a certain role – it has a job to do – but if one species is unavailable (because of a disease outbreak, bad weather, etc.) other species can usually fill in and cover for it. Next, I asked the kids for an example of a prairie species that plays an important role. Most of the time, someone said “bees”, which was perfect. If not, I provided that answer after discussing the ones they came up with. We talked briefly about the importance of pollination, the number of bee species found in many prairies (often 50-100 species), and that most of those bee species are “solitary bees”, meaning a single female trying to build and care for a nest of eggs. That female digs a tunnel in the ground (usually), lays an egg and then collects enough pollen and nectar to feed the larva until it becomes an adult. She seals the egg and food into a cell and then starts another cell on top of it. This tiny bee was visiting purple prairie clover outside our field headquarters yesterday. Its nest must have been fairly close by because an insect that size can’t travel very far. I then showed them a couple sweat bees, and we talked about how bees that small couldn’t fly very far from their nest. Then I had them look at a circle of flags I’d put up around us (a circle with about a 50 meter radius) and told them that for some very small bees, a circle that size was basically their entire universe with their nest in the center. Within that circle, a female bee would have to go out every day and find enough food to both stay alive and provision her eggs. Next I split the kids into groups of two or three and handed them a little bag with a wildflower in it. All of the flowers in the bags could be found within our circle of flags, but some were much more abundant than others. I told the kids they were solitary bees and their job was to spend the next five minutes counting the number of flowers (blossoms, not plants) within the circle that matched the one in their bag. Off they went! After five minutes, I called them back in so we could talk about their search. Some of the kids struggled to find any flowers that matched their sample, while others came back with counts of between 100 and 200 blossoms. This led to a great discussion about the importance of plant diversity to bees. If a bee relied on only one plant species and it wasn’t very common within the “universe” around its nest, it would probably starve – especially because it would be competing with other pollinators for the pollen and nectar from those few flowers. Even if the bee’s flower species was really abundant, it might only bloom for a few weeks, so once it was gone, the bee wouldn’t have anything left to eat. However, if the bee’s universe contained lots of flower species it could feed from, the bee was likely to find enough food for itself and its eggs throughout its entire life. What would this prairie look like through the eyes of a tiny bee trying to find food for itself and its eggs? To wrap up, I reinforced the point that bees rely on having lots of choices of plant species to feed on. If one plant species is unavailable, there are others that can provide the food the insects need. At the same time, most flowers also do best when there are lots of pollinator species available to visit them. In a prairie with a diverse community of bees, it’s less of a big deal when a few of those bee species are low in abundance because of weather or disease. Other bee species can cover for them and flowers still get pollinated. Finally, I said that while we’d been talking about bees and flowers, biological diversity was important in many other ways as well. Many herbivores need lots of different kinds of plants so they can find high quality food all year round. A wide range of available prey species is important to predators. And so on. When a prairie, or other ecosystem, loses too many species, it’s just like a restaurant losing too many employees. At some point, there’s no one left to cover for someone who gets sick, and the system breaks down. 2. The circular “universe” around a solitary bee nest has been a really useful idea for me over the last several years. While the size of that circle varies quite a bit by bee species, the concept has changed the way I evaluate our prairie restoration and management. When I walk around our prairies, I often stop and think about what a solitary bee would experience if it were nesting there. If you’re in charge of a prairie, I’d encourage you to try it sometime – maybe it’ll be helpful to you as well. 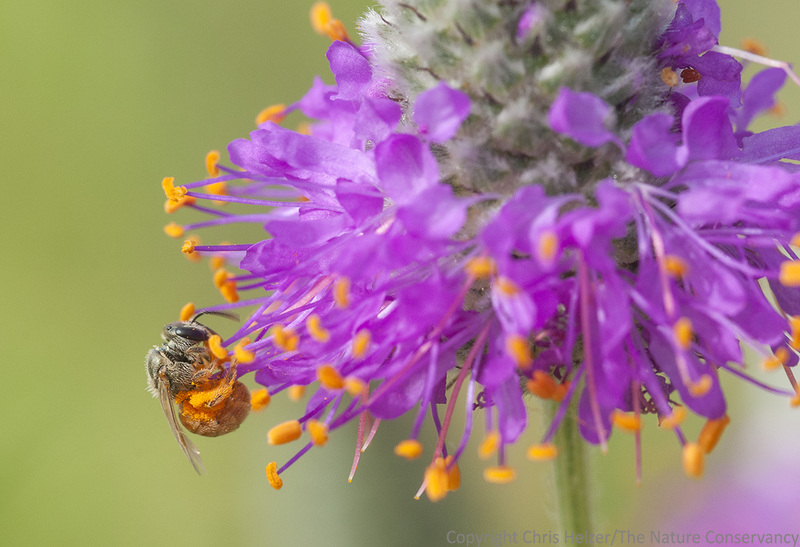 This entry was posted in Prairie Insects, Prairie Plants and tagged activity, bee, camp, children, day camp, educational, kids, nature, outdoor activity, pollinator, prairie, prairie plains, SOAR by Chris Helzer. Bookmark the permalink. And You know what. It worked on me also and I’m 57! Have to say I love the picture with the porcupine grass! great idea….i’m going to use that activity at our next pollinator workshop…..hope you don’t mind if I steal it. It is a nice story, but is there science behind it? Natural selection favors the efficient. Pollination is most efficiently achieved when a plant adapts to one specialized pollinator. The fact that some plants can be pollinated by numerous species appears to be a relic of evolutionary history rather than a strategy by plants to hedge against ecosystem change. If enough species are lost will the whole ecosystem unravel or just the parts we value most? I think grassland ecosystems could exist without pollinators. However, grasslands without pollinators would not be prairie. I have seen overspecialization in the field (Google “Lange’s Metalmark,” a butterfly that nectars only at a subspecies of buckwheat at Antioch Dunes NWR near San Francisco; loss of the sand dunes to industry now severely imperils the butterfly). But many pollinators are generalists, even though bees on a given day will exhibit floral constancy; that flower loyalty shifts as time passes and new nectar/pollen resources open up. Plant a good-sized native-plant garden within decent surrounding habitat, and you will see pollinators use a variety of plant species as the seasons pass. You will also find there is little specialization on one pollinator by wild plants. Butterflies, native bees, beetles, bee flies, hoverflies and moths all visit my various wildscape plant species. Survival almost always trumps efficiency for both plants and pollinators in my part of the subtropics (Houston and surroundings). Chris – thanks so much for helping kids grasp pollination and what it means. The little bee on the purple prairie clover was most likely Lasioglossum (Dialictus) hudsoniellum based on our sampling there.